Discussion in 'Online Games - News and Reviews' started by Kotsy, Oct 13, 2013. Georgie Porgie pudding pie, kiss the girls and make them cry. Wow, did Microgaming bring back some memories from my childhood with this one. How many heard this in their childhood at grade school? Georgie Porgie will not stop at anything to steal a kiss or two from the girls. but for an Online Video Slot, please come calling Georgie Porgie. Your kisses are welcomed. 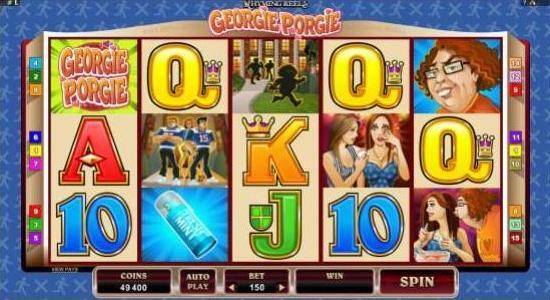 Georgie Porgie is a hilarious Online Video Slot that carries on the theme from Microgaming with The Rhyming Reels series. Quirky looking characters, with funny sounds. It takes a few steps ahead of your average childhood rhyme. Add a bit of naughty to it and now as adults, we can play it online. 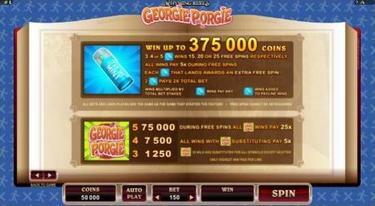 Georgie Porgie is a 5 reel, 3 row, 15 payline video slot. Players have their choice of number of coins to play and amount per line. To maximize your winnings, the bigger the bet, the bigger the payout. There is also a gamble feature which plays can gamble their winnings or not. All wins pay left to right except the Breath Mint Scatter symbol which can appear anywhere. Georgie Porgie logo symbol is wild and substitutes for all symbols except the Breath Mint Scatter. Free spins are activated when you receive 3 or more of the Breath Mint Scatter symbol anywhere on the reels. You'll receive 15, 20 or 25 free spins. All wins are multiplied by 5. During the free spin feature any wins with a Georgie Porgie wild symbol will have winnings increased to 25x's. If you receive a Breath Mint scatter symbol during the free spins, you'll earn an additional free spin with 2x's the multiplier. What a great way to go back to childhood memories with the Rhyming Reels Series. What a nice Review about the new Georgie Porgie Rhyming Reels Slot! This Slot looks like so much fun!